The end result displayed at the moment in what I describe as the model cube. I must admit that having thought about making a 1/12th scale globe my first problem was either making or finding a ball of the correct size. 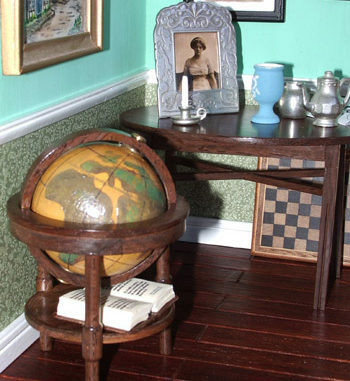 After some scanning through antique books I had a basic idea in my head for the type of globe and the size of the ball being 18 to 20 inches across. This would be a ball roughly 1.5 inches in diameter at this scale. Now, ping-pong balls are 40mm in diameter. 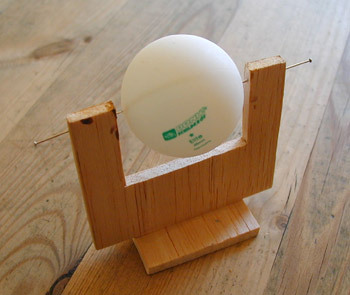 This shows a ping-pong ball held in my simple balsawood frame with pins. I carefully nipped the ping-pong ball between the pins and rotated it, moved the pins slightly to get it dead centre and kept adjusting the pins until it was aligned perfectly. It is worth the time taken getting this correct. I then pushed the pins through the surface of the ping-pong ball to hold it very securely. The ball was first painted with a cream acrylic paint. The land masses were then painted on carefully in a dark green and the high points added as a dark purple. This took several hours to get correct and patience as I had to leave the paint to dry between layers. The lines of latitude and longitude were added using a black ball point pen held against the surface of the globe and the globe rotated slowly. The ball was moved, aligned and the lines in the other direction added. The frame was made from walnut and I’m not going into great detail here, but the above photo shows some of the parts ready for assembly. The main ring has a diameter of 54mm and a depth of 7mm. The clearance to the globe is 1mm. 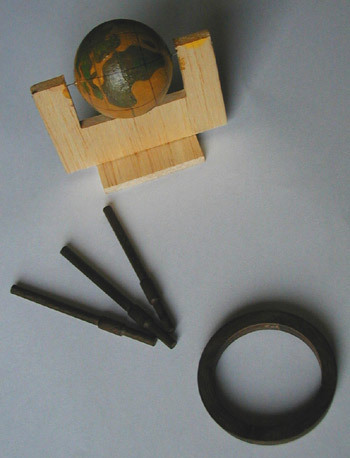 The ring that holds the globe has an inner diameter of 42mm and an outer diameter of 46mm, the globe is held with two brass pivots and two brass washers are used to space the globe away from the wooden ring. The legs are 4mm diameter and 48mm long, note the wider section that had grooves machined to hold the lower table (46mm diameter and 2mm thick). The height to the top of the main ring is 50mm. 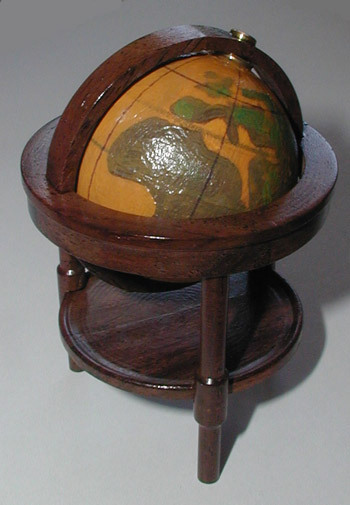 The final result is an authentic looking globe.